One month after the American opening dates of "Star Wars Episode 1: The Phantom Menace" (henceforth referred to as "SWEOPM"), an even more historic debut took place: the exhibition of the "film" via a "non film" medium. Some people involved in the program are calling it "electronic cinema", but others (this writer included) are more reserved, and the term cinema is allowed only for actual exhibition. All the rest is mere video, no matter how you dress it up with a fancy name. A sizeable crowd of press people were attracted to the AMC 14 in Burbank, California, on June 17, 1999 (The day before the public could buy tickets), at the invitation of Texas Instruments Co., for a presentation and demonstration of the process. This was not the first time that film and video projection have been compared. However, it would go on the books as part of the first commercial dramatic film to be run in this mode for which members of the public would be allowed to but tickets. (Their claim for "first" was somewhat diluted by a simultaneous opening of "An Ideal Husband" at competing LA and NY area theatres). Among the VIPs at the front of the house were Tom Sherak, director of domestic distribution for 20th Century Fox, Monica Dashwood, general manager of Lucas Film´s THX program, and Rick McCallum, who is listed as producer of "SWEOPM". In addition, there were key people from Texas Instruments and CineComm present at the dais. It is interesting to note that there was not one representative of "film" at this gathering. The TI system utilizes 1.310.000 miniature mirrors, mounted on a tiny chip. Tha native resolution is 1280 x 1024, and the program was transferred (high definition) at 1920 x 1024 compressed. The mirror positions are updated (adjusted) at up to 50.000 times per second (! ), which is how they shade the colors. The sound was from interlocked digital, 6 discrete channels, at 44.1 sampling rate. The picture was stored on 18 hard drives, a Pluto HyperDrive Raid array, compressed 4:1 with a Panasonic drive. The Texas Instruments digital projector. After some brief presentations, it was time for demonstrations. First was video only (the scene where young Luke Skywalker teaches himself to fly), followed by a side-by-side comparison of video on the left/film on the right of an early sequence in the film´s story line in which, in their intergalactic Senate, the constituents are complaining about their treatment by the Federation. The screen was 42 ft (12,80 m), and TI claims its system is suitable and capable for screen sizes up to 55 of 60 ft (16,8 - 18,3 m) wide. TI does not make a projector, per se, but plans to license the technology to other companies to make their brand of projectors. Hughes/JVC, on the other hand, are concentrating on a different brand of projection process (proprietary to JVC/Hughes) and developing (with CineComm) and integrated system for delivery by satellite to the local venues. After the demonstrations, the floor was opened up for questions. Most of the questions were straight forward ("How does it work?"). Other, more speculative questions also came out ("What are implications for theatres? "), which were unable to be answered at the moment. There are a lot of unanswered questions about who will build the "projectors" and how will the programming be distributed and stored. Using figures from unspecified sources, Mr. McCallum stated that, in the United States, there are currently approximately 32.000 theatrical screens. Of those 32.000, he said, only 350 (!) are what they (Lucas Film) consider top-notch, "quality" theatres. Rounding off those numbers a bit, only 1% of the screens in America are up to proper presentation quality! Mr. McCallum did not explain how converting to expensive new technology (video) would improve presentation in the 99% (!) of American screens whose owners do not already see fir to run their films somewhere near to appropriate standards. What if that percentage runs even lower...? These video projection devices are expected to cost somewhere on the order of (USD) $100.000 each. Who is to pay this cost is one of the unanswered questions, and since theatre owners have historically declined to spend money on top-notch equipment, it appears to this observer that, should this change become mandatory, perhaps 1% of American screens will continue to have top-notch presentation (via video), and 99% will continue to suffer from substandard presentation, but now from even worse video. In the long-run, we will all have lost, because of the other limitations of "video". Video projection may be the juggernaut heading towards us, because George Lucas says it is "good". Or (wait a minute), maybe it´s a Trojan Horse...! Who appointed George Lucas the visionary of the 21st century? I´d like to hear Marshall McLuhan´s take on this. After July 15, the video demonstrations disappeared, so we now have to wait and see what happens next, here in Hollywood. It´s clear that many film distribution executives are literally drooling at the prospect of eliminating the cost of film prints...but at what cost to the public, who enjoys the benefits of seeing their programming of film, not video? OOps, I forgot: the executives don´t care about the audiences. It seems no matter what bilge they produce, people spend money to see their shows. 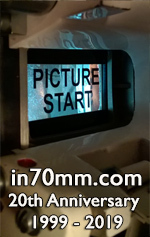 If there was ever an occasion for the "rebirth" of 65mm/70mm and its superior image quality, that moment seems to be now. The watchword from Fox and TI seems to be that you should "come see the future"... This observer, at least, hopes that Hollywood wakes up and brings back 70mm filming. But don´t hold your breath! There seem to be many who don´t care about the audience experience, only the dollars and nonsense of converting to exhibition by video. Someone in the audience asked if they (TI) had considered comparing their image to IMAX. ("No!") Me, I would have been happyy if someone from the film club had been there with a demonstration of 65mm/70mm. Maybe that will happen next year. Or am I dreaming....?